Dr. Spilkia is a well-known Philadelphia area dentist who has improved the smiles of many patients in his dental clinic. Our team understands that it’s important for patients to have a healthy, beautiful smile they are proud to show off. A beautiful smile can increase confidence and self-esteem, which has a tremendous impact on both professional and personal relationships. For patients who are unhappy with misaligned teeth, Invisalign is a great option. Many adult patients are hesitant to undergo traditional orthodontic treatment, which is why Invisalign has become an invaluable tool. Patients can now enjoy a straighter smile without metal brackets and wires. Instead, Invisalign uses a series of clear, soft plastic aligner trays that are removable to gradually shift teeth into proper alignment. Dr. Spilkia can improve patients’ smiles and confidence with the help of Invisalign. The treatment is discreet and straightens teeth quickly and effectively. Removable. The clear aligner trays fit snugly in place over the teeth, but are removable for eating and oral hygiene. Patients can still enjoy their favorite foods and keep their gums and teeth healthy during treatment. Comfort. The metal wires and brackets of traditional orthodontic treatment can be uncomfortable and abrasive to the inside of the mouth. 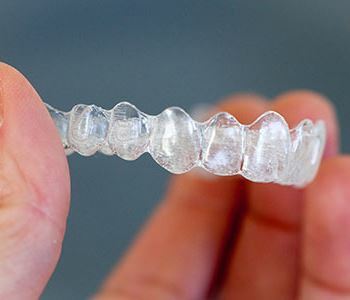 Invisalign trays are made of a comfortable plastic and are easy to wear. Time-saving. In most cases, Invisalign treatment can be completed in less time than traditional orthodontic treatment. There is no tightening of the wires, which means fewer dental appointments for patients! If you like the idea of a straightening method that is discreet, fast, and cost-effective, call our dental clinic today to schedule a consultation. Once we meet with you, we can determine if you’re a candidate for Invisalign and start your journey to a straighter set of teeth.